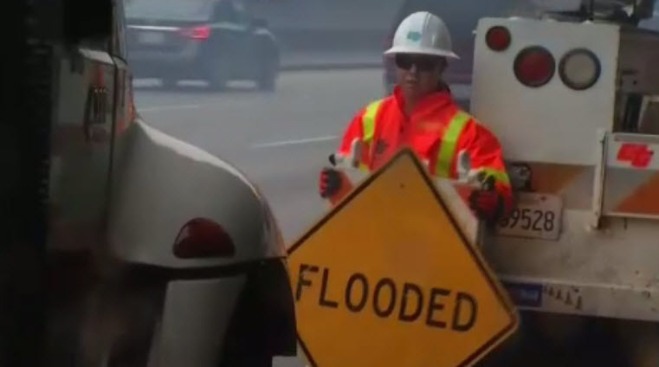 Crews were busy around the South Bay on Tuesday, cleaning up after the first major storm of the year, specifically flooded roadways like Highway 17 and Interstate 280. In addition to low visibility and constant rain, drivers had to contend with another challenge: excess water on the pavement. Several sections of highways were flooded, forcing many motorists to sit and wait while workers cleared the way for safe travel. Two inches of water covered the slow lane of northbound Highway 17, south of Hamilton Avenue in Campbell. Crews did their best to clear the area, but the effort caused delays and traffic backups. Highway 101 in Morgan Hill also saw significant flooding. California Highway Patrol officers say the critical mistake drivers make when they come across flooded roadways is slamming on the brakes. "The safest thing to do is take your foot off the accelerator," CHP Officer Ross Lee said. "Don't touch the brake, and maintain the steering wheel so you are driving straight. Then safely drive through that area." Mike Kazemi, a commercial bus driver for 50 years, says he's seen too many drivers ignore the dangers of slick roads. "They see the water on the freeways, and they don't care; they keep going," he said. "But they are not driving a car at that point; they are in a boat. I see the accidents every day." The storm also opened up new potholes, which can be dangerous. The CHP said hitting a large pothole could make a vehicle pull or drag, causing a driver to lose control. CHP officers say they see the most flooding along freeway onramps and offramps. The rain was expected to subside later Tuesday, forecasters said.